Here’s a great look at the Rei de Búzios, one of Brazil’s longest-running SUP races and something of a preview for this year’s ISA Worlds. WATCH: Epic highlights from Carolina. As the countdown continues to this weekend’s big Quiksilver Waterman Carolina Cup, we just finished our “Fireside Chat” Facebook Live stream with the NSP/Surftech crew here in Wrightsville Beach. Watch a full replay above to hear from two-time defending champ Titouan Puyo, Molokai hero Travis Grant, last week’s giant-killer Marcus Hansen and the legend Joe Bark, then tune in for the race day livestream from 10am Saturday. The Alpine Lakes Tour in France has once again delivered on the double: a great event and a great recap video. The Tour, which begins each year with the almighty GlaGla Race and includes the epic “BAT Race,” continued on the weekend with the aptly-named Very Flat Race, which takes place on placid Lake Aiguebelette in the French Alps. This year’s event was dominated by the Teulade Brothers, while the day also featured the epic Red Dragon showdown (we’ll be at the Dragon World Championship at the end of August). Air France Paddle Festival: Watch highlights from paradise. 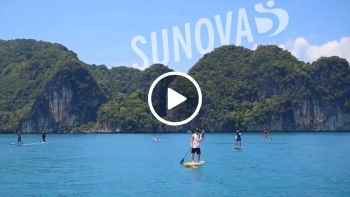 Great highlights from the first stop of The Paddle League World Tour, where Marcus Hansen and Sonni Honscheid produced memorable victories and hundreds of paddlers enjoyed a swelteringly-hot day on the water. If you’re having trouble loading the video on mobile, click here to watch directly on Facebook. Watch a full replay of the epic Air France Paddle Festival in Tahiti, first stop of The Paddle League World Tour. On the eve of The Paddle League World Tour, we sat down with world number one Connor Baxter for a chat about the big season ahead. Connor shared his thoughts on The Paddle League, the next generation, his love of paddling, and… getting married. Watch above and enjoy, and follow The Paddle League on Facebook and Insta for more. Connor begins his season this weekend at the major Air France Paddle Festival in Tahit, which you can watch live on The Paddle League from 11am local time Saturday. From Santa Cruz to the South of France, here are the headlines that made waves this week. Rapid fire recap of the Hoe Toa Paddle Champs in New Zealand today, where Lincoln Dews upset the Kiwis and Penelope Strickland took out the women’s race in some pretty nice downwind conditions. The Paddle League pre-season event wraps up tomorrow with the beach race. BAT Race: Here’s the highlights reel from last week’s bucket list event in Switzerland. Highlights from last week’s epic “BAT Race” aka paddling on an underground lake in Switzerland. Bucket list. It’s been another big few weeks in the world of stand up paddling, with superstar injuries, surprising upsets and a big international season led by The Paddle League set to begin shortly. Catch up on the major headlines with the Rogue Recap, and get set for a big year on and off the water. And as always, big thanks to Rogue SUP for the support. 2 Minutes with Titou: Why Is New Caledonia So Good, and Which Race Do You *Really* Wanna Win? We had a quick chat with NSP/Quickblade team rider Titouan Puyo after his big win at the SUPs Down Under ‘Double Downwinder’ on the Gold Coast today, where Titou led an onslaught by the tiny but powerful Pacific island nation of New Caledonia. New Caledonia, whose population is barely more than 1% that of Australia’s, took four of the top five spots to completely own the home team, with only runner-up Lincoln Dews getting in the mix. Let’s count how many strokes DEEP team rider Lincoln Dews takes in the first minute of the 12 Towers Ocean Race using his trusty QB Trifecta. This year’s 12 Towers Ocean Race on the Gold Coast, part of The Paddle League pre-season series, was a tough one. It was hot. It was humid. It was downright brutal out there on the water, but it was also a hell of a lotta fun. With a stacked field of top names and a massive gathering of amateur participants, the 7th Annual edition of this classic race will go down in the history books for sure. You can watch a full replay of our Facebook Live stream if you’ve got an hour and a half to kill, but if not, here’s a 60 second, rapid-fire recap of the day. Replay of our 12 Towers live stream direct from the very hot and very humid Gold Coast today. Thanks for everyone that tuned in, and apologies for the bumpy ride in the first part of the stream! The footage above kicks in around the 20 minute mark of the race, after which we had a relatively smooth ride all the way to the finish. Follow The Paddle League on Facebook and Instagram for more coverage, and thanks to everyone that helped make it a great a day on and off the water! I just got back from a week in Thailand with the Sunova crew. It was fun. These guys don’t just know how to make great performing (and great looking) boards, they also know how to embrace the very lifestyle they’re promoting.